Synthetic shingles have become a popular alternative on the Outer Banks because they have the appearance of cedar shake shingles or slate. Gallop Roofing & Remodeling Inc. is proud to offer award-winning synthetic slate and shake roofing products. Synthetic shingles are easier on your wallet than natural roofing products. However, they do not compromise on beauty. The polymer roofing tiles are also easier to maintain in addition to being far more cost effective than the natural products. Every day there are even more products coming onto the market in this category. You never know what could be waiting for your next roofing project, it all depends on what your decision is and whether the roofers you choose have experience on the field or not! Our manufacturer of choice, DaVinci Roofscapes®, leads the industry in tile thickness, tile width variety, and the greatest selection of subtle earth-toned colors. There are a variety of beautiful options awaiting you. DaVinci Roofscapes® products also have a 50-year warranty and are 100 percent recyclable. 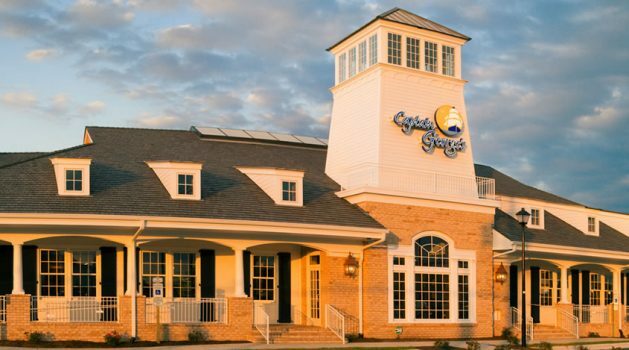 Give us a call today to see how synthetic shingle roofing can meet your roofing needs..
Captain George’s Seafood Restaurant in Kill Devil Hills, NC is a great example of the work done by Gallop Roofing & Remodeling, Inc. We completed the project in 2010. It is still as beautiful as the day we installed it. Also, check out this Project done by DaVinci Roofscapes® about Captain George’ and Gallop Roofing & Remodeling, Inc.